The food traditionally eaten on Halloween (or All Hallows Eve) in Western Christian societies is mostly vegetarian as it was encouraged to abstain from eating meat due to meat’s flesh-like qualities on a day where the dead are remembered. So, naturally, I have crafted Vegan, dairy-free, gluten-free and even grain-free alternative to the classic pumpkin pie. This version is also in fact nut-free, however you could easily top it with some pecans for some nutty goodness. 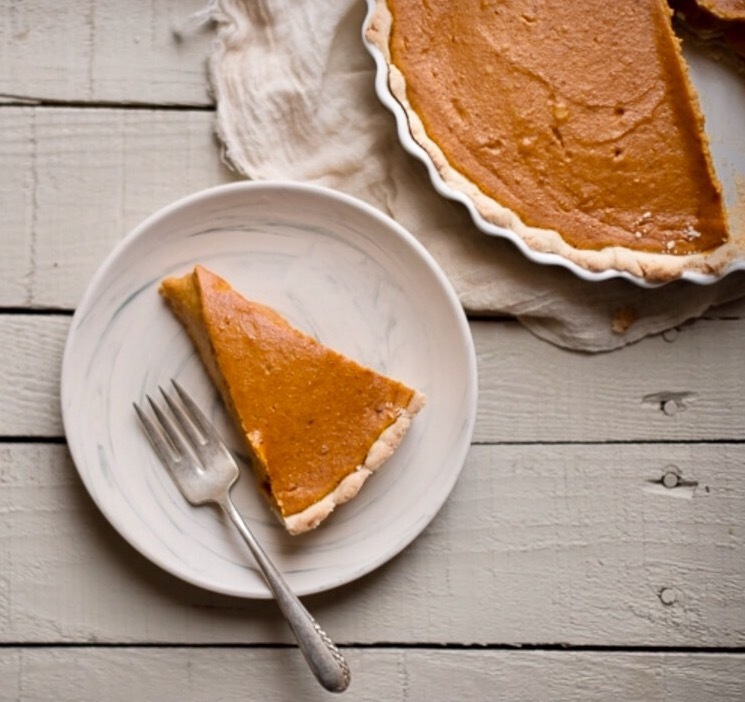 Pumpkin is a serious superfood being incredibly nutritious yet naturally sweet. Immune-boosting pumpkin contains the incredible antioxidant beta-carotene, and is also packed full of potassium – in fact it 1 cup of cooked pumpkin has 560mg of potassium compared to a banana’s 422mg – making it a fabulous post-workout food. A little extra potassium helps restore the body’s balance of electrolytes after a heavy workout and keeps muscles functioning at their best. The crust contains arrowroot starch which is a perfectly natural way of binding it together. You can buy this cheaply in most supermarkets – both organic and regular kinds – and it’s a fantastic addition to your baking ingredients cupboard as can be used to thicken or bind many cookies, cakes and generally gluten-free home-bakes. So treat yourself to a slice of this warming, spiced deliciousness on Halloween – it’s terrifyingly good! Refrigerate the coconut oil for at least 20 minutes to ensure it’s until well-chilled. In a large bowl, combine the flour and arrowroot starch, add the sugar, cinnamon and vanilla and mix again. Add the coconut oil and mash together with your hands – or better with a fork or in a food processor if possible, to stop it melting – until the mixture resembles large crumbs. Gather the dough into a ball and wrap in cling film and place in the fridge for at least 15 minutes. Pre-heat your oven to 180 C while the dough is chilling. As this dough is better for pressing into the pie tin rather than rolling, wet your hands and break the chilled dough into small pieces and press it into 9-inch pie or tart pan, pressing down to cover the bottom and sides. I like to pre-bake the crust and so pop it in the oven for about 10 minutes on a middle shelf. Remove from the oven and set aside to cool while you work on the filling. (Keep the oven on). Combine all the remaining ingredients in a large bowl and mix with a spoon or hand blender. Then tip the pumpkin mixture into the pie crust and smooth until level. Place in the oven on the middle shelf and bake for about 30 minutes until the pie is firm to the touch. As this is a grain-free crust it won’t brown too much. Bake for about 30 minutes, until the pie is somewhat firm to the touch (it will get firmer as it cools). This is a grain-free crust, so it won’t brown. Remove from the oven and let it sit for about 25 minutes, and then keep in the fridge as it’s best served chilled. Devour with a dollop of coconut yogurt and store any leftovers in the fridge for up to 2 days. By Amelia Stewart of Cook First. For more of Amelia’s delightful recipes, please visit www.cookfirst.co.uk/samplerecipes. Copyright © 2018 FORM Studios.